Fancy a new word? HP's got one: Sleekbook. What's a Sleekbook? According to HP, it's an Ultrabook that doesn't have Intel inside, and as Intel owns the Ultrabook name, it has to be called something else. As a result the new HP Envy range will include both Ultrabooks and Sleekbooks, and that's not going to be confusing at all. 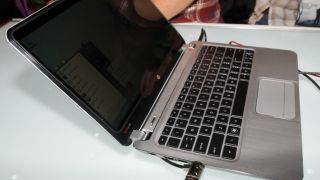 HP's new flagship Ultrabook is the Envy Spectre XT, and we've already been up close and personal with it. At just 14.5mm thick it's supermodel skinny, but a fast processor and SSD means it goes like a scalded cat. Where the Spectre is sleek, Toshiba's new Excite tablet is enormous: with a 13.3-inch screen it's like an iPad for giants. Is it any cop? It is, but it's also very big. According to Nick Vargus, "Toshiba has unequivocally answered the question nobody was asking - 'what size is too big?' The Toshiba Excite 13-inch tablet is the answer to that question." The comparatively tiny Samsung Galaxy S3 is "inspired by nature" and "sees, listens, responds and allows you to share the greatest moments." No, us neither, but it is a pretty nifty bit of kit. How nifty? This nifty: "The Samsung Galaxy S3 has got all the hallmarks of the best Android phone yet," says our resident phone wizard Gareth Beavis. Is it better than a Galaxy S2? We had to find out. What about the iPhone 4S? The HTC One X? A horse? Is it better than them, too? We had to find that out as well, apart from the horse bit. The answer? It depends... the S3 is a stunning bit of kit, but it's also a pricey one. Samsung is the king of Android phones, but what about former chart-topper HTC? We love its new HTC One series phones, but it seems that they aren't the blockbusters HTC was hoping for: HTC's struggling to match last year's sales figures, with rivals such as Samsung and Apple pushing it down the Samsung charts. One of HTC's problems may be Android and Windows Phone: its phones run the same OSes as many of its rivals' top-end phones, which makes it harder to stand out from the crowd. An HTC-specific OS has been rumoured ] for years, but while HTC may or may not be doing it Samsung definitely is. Samsung's own OS is Linux-based, it's called Tizen, and it's already broken cover. The handset's still a prototype but it's already looking very interesting. Tech firms aren't just fighting in the shops: they're fighting in the courts, too, and it seems the courts are beginning to lose patience. Californian judge Lucy Koh has ordered Samsung and Apple to cut down the size of their court filings, arguing that the mountain of claims and counter-claims is "cruel and unusual punishment to a jury". Koh isn't the only one getting fed up: the International Trade Commission threw out a 3,000 page attachment that Apple wanted to add to its case against Samsung. "TL;DR", Judge E James Gildea said, probably. In other legal news, the Pirate Bay block appears to be going well: all kinds of how-to guides, mirrors and proxies have sprung up to help people evade state censorship of the pirate site, boosting traffic far beyond pre-block levels. Unfortunately it seems that some of those sites are a bit piratey, and the Pirate Bay for one isn't happy about that: Yarrr doing it wrong, they say. "We've noticed at least 3 sites that are tricking users to buying access or similar," TPB says. "We do not condone this behaviour". As Chris Smith puts it: "the message is clear. Beware of those illegal torrent sites, which are illegal copies of other illegal torrent sites." That noise you hear in the distance is the sound of the entire entertainment industry going LOL.